Why Hasn't Yemen Hunted Down Anwar al-Awlaki? A still image from video released by the SITE Intelligence Group on Nov. 8, 2010, shows radical Yemeni cleric Anwar al-Awlaki in a video lecture titled "And to Make It Known and Clear to Mankind"
Could Anwar al-Awlaki be hiding in plain sight in Yemen? He certainly knows when and how to make an appearance. On Monday, Nov. 8, the Yemeni-American cleric released a video rallying his followers to murder Americans. "Do not seek any permission when it comes to the killing of Americans. Fighting the devil doesn't need a fatwa [religious edict]," the bespectacled and bushy-bearded orator said in Arabic, while dressed in traditional Yemeni long robe, headscarf and tribal dagger. "This is a battle of Moses and pharaoh. This is a battle of righteousness and falsehood." The footage was crisp and professional. And al-Awlaki's timing was audacious: just two days before, a judge in Yemen had ordered police to capture the radical preacher "dead or alive" after he had failed to show up at his trial a week ago. That, of course, followed days of global consternation over the cargo-bomb plot allegedly brewed up by al-Qaeda in the Arabian Peninsula (AQAP). 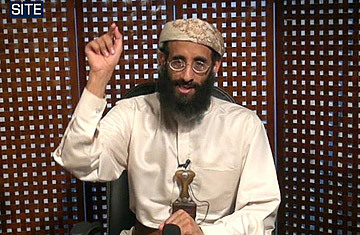 Al-awlaki is believed to be the group's spiritual mentor. In the West, al-Awlaki is caricatured as a Yemeni Osama bin Laden, hiding deep in the mountains, fearing for his life as U.S. Predator drones circle above. But for many Yemenis, al-Awlaki is more of an Al Capone, a known outlaw traveling with impunity and some social cachet. A resident of Shabwa, the arid, mountainous southern province where al-Awlaki is believed to be living, tells TIME the cleric was seen only a week before the cargo-bomb plot unfolded. He was part of a convoy on the way to the north. "I saw him driving along with five cars following," says the resident, who asked not to be named. "People here see him a lot." One Yemeni corporate-security adviser with close ties to tribes in al-Qaeda hot spots says, "We are 100% sure the government knows where [al-Awlaki] is." Born in New Mexico to Yemeni parents, al-Awlaki took the terrorism spotlight after he and his preachings were linked to a U.S. Army psychiatrist who killed 13 people in Fort Hood, Texas, on Nov. 5, 2009, and then to a Nigerian student accused of trying to blow up a Detroit-bound passenger jet on Christmas day that year. Al-awlaki speaks fluent English with an American accent and has proved his ability to recruit Westerners, who can move with ease across international borders. While YouTube has removed some of his sermons, many of his other English-language videos remain accessible. This year, Yemen came under intense pressure from Washington to crack down on al-Qaeda's local offshoot here. But despite the additional pressure emanating from the cargo-bomb plot, Yemen seems to be in the same position it was two weeks before: nowhere. Critics now doubt that the country is up to the challenge of quelling the growing al-Qaeda threat or capturing or killing al-Awlaki. The government of Yemeni President Ali Abdullah Saleh has made many noises about hunting down al-Awlaki, at one point announcing it would send 3,000 troops to Shabwa to search for the cleric. However, residents there tell TIME there has been no visible military build-up. Meanwhile, Saturday's court-ordered arrest is seen as another futile gesture by the government in Sana'a. Critics here refer to the al-Awlaki trial (on charges of belonging to al-Qaeda and inciting the murder of foreigners) as a "game," mere rhetoric to appease the U.S. The Yemeni government insists there is no link between the timing of the arrest order and the international furor over Yemen's role as the point of origin for the parcel bombs. What might happen if Yemen actually arrested al-Awlaki? There is some fear of a backlash from the cleric's mighty southern tribe, the Awlak, which is believed to be sheltering him. With a weak central government, and vast expanses of the country under tribal control, President Saleh is constantly juggling the needs of different tribal sheiks to avoid uprisings. And so, AQAP members like al-Awlaki, who are protected by powerful tribes, are virtually guaranteed sanctuary. Sana'a is already fighting two domestic insurgencies: a rebel faction in the north and a separatist movement in the south, where tribes play a large role in rallying troops against the regime. Asking Sana'a to capture al-Awlaki and come down hard on sheltered AQAP militants could stir up tribal clashes and plunge the country into further instability. Before any counterterrorism decision is made in Sana'a, the implications of angering an influential family or tribe are considered. Daniel Masterson, an expert on Yemeni politics at Harvard, says Sana'a doesn't have the political leverage to demand that tribes hand over AQAP members in the south. "The government is hard-pressed to make demands of southern political leaders, most of whom are generally aligned with Yemen's opposition parties," he told TIME in an e-mail. But in the cleric's case, there is an additional factor: al-Awlaki's father is a former Agriculture Minister and remains a prominent member of Saleh's ruling party. Nasser al-Awlaki has sued in U.S. court, questioning the constitutionality of the presidential authority to target militants like his son. Some tribal leaders claim to know the whereabouts of the man who is now among Washington's most wanted (though there does not seem to be an American reward for his capture). "Do you want me to set up an interview with al-Awlaki?" a tribal sheik asked this TIME reporter nonchalantly. "If your publication can pay $1 million, I'll take $500,000 for the service and your protection, and we'll give [AQAP] $500,000." The sheik, who says he mingled with al-Awlaki before he went into hiding, added that no money would need to change hands until after the interview took place. TIME declined the offer.